We all knew it was coming, even if we didn't want to admit it. In September 2018, Google announced that Inbox by Gmail would be going the way of the dodo, with only a vague March 2019 date given for the shutdown. A quick check of the calendar tells me that it's March 2019 right now — doesn't time fly — which means the end is nigh. 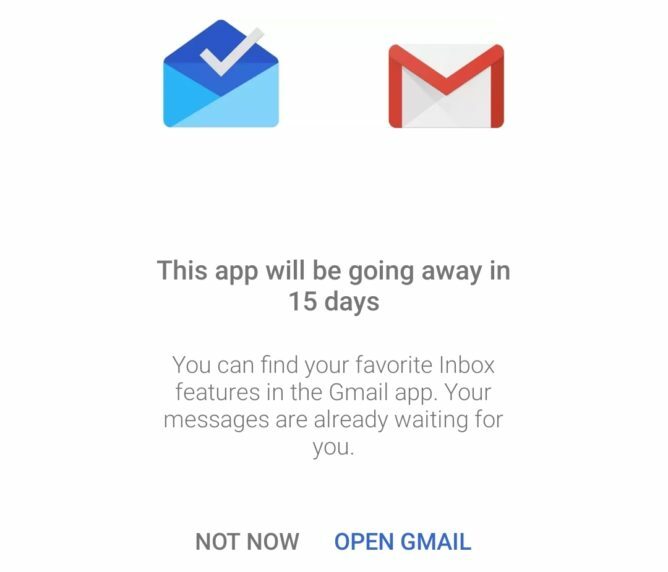 If you've opened the Inbox app on your phone in the last day or two, you may have been treated to the below splash screen telling you that Inbox is soon to die before plainly lying to you: "You can find your favorite Inbox features in the Gmail app." So Gmail has bundles? And inline tasks? And pinning with notes? No, Google, it does not. Gmail does not have my favorite Inbox features. At least, not yet. Gmail has gained snoozing and follow up nudges from Inbox, so that's something. Also, Tasks now has timed reminders and the ability to recur them, so that's a more viable alternative than before, even if it's not quite the same. There are also other apps out there that mimic features like saving links to Inbox. We have heard that Gmail will eventually get bundles, too, although it's still very frustrating that all of Inbox's great features haven't been ported over before the app goes away. At least we get until April 2 to finally give it all up and start using the inferior Gmail instead. That's two days more than was originally promised. That's a win, right?